The very worrying standoff in Tripoli must be ended by peaceful means UNSMIL chief Martin Kobler told Libya’s neighbours adding that the country’s situation had become increasingly delicate in the last seven months. 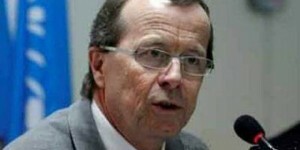 Kobler was in the Niger capital Niamey yesterday talking to the ninth ministerial meeting of countries bordering Libya. He condemned the takeover of the Rixos premises of the High State Council in Tripoli. “Attempts to create parallel institutions and obstruct the implementation of the Libyan Political Agreement will generate further disorder and security” he said, “This standoff should not escalate into violence. It has to end peacefully”. “Libya is at a critical stage” he warned, “These next few weeks will show whether Libyans are able to chart a way together towards peace or risk slipping into renewed conflict. Either we move together united or we fall divided”. Kobler’s speech was particularly downbeat for a man who has seemed inexhaustible with his endless flying between talks in an uncomfortable UN aeroplane. He made a point of mentioning his recent visit to the Fallah migrant detention camp, which had clearly shaken him. “I saw the abominable and unacceptable circumstances in which the migrants were kept. Everything is lacking, water, hygiene and even air” he said, adding “The only things that we can find in abundance are diseases and despair. Libya is certainly not a country where migrants can return safely”. He praised the EU’s migrant training for Libyan coastguards but said it was not enough. The international community had to do something about the humanitarian situation in the detention camps and better finance repatriations undertaken by the International Organisation for Migration. It should also work with the countries from which the migrants came in order to address the reasons that they chose to leave in the first place. “Irregular migration”, said Kobler, was one of three problems that had to be tackled as a matter of urgency. The others were organised crime and the fight against terrorism. On this last, he said there was hope. “Libyans have and continue to show resolve to improve their situation. From Sirte to Benghazi, progress is being made in the fight against terrorism. Da’esh (IS), which only months ago was expanding its territory, is now a shadow of what it once was”. Kobler said that the Presidency Council had been unable to extend its control and govern the country because for the last six months the House of Representatives had been unwilling to vote on the Government of National Accord. In addition, too many Libyan “security actors” were operating autonomously. There continued to be no progress on creating the security structures envisaged by the Libyan Political Agreement . The PC was also still struggling to establish an effective system of governance. This had resulted in a decrease in basic services which was compounded by a worsening economy. “Daily life for Libyans is becoming more difficult” he said, “With oil production well below its potential, inflation of the Libyan Dinar is at nearly 20%, food prices are increasing and the lack of liquidity means that cash is becoming scarce”. He urged the PC and the Central Bank to tackle these problems and ensure that Libya’s resources were used effectively for its people. Kobler told his ministerial audience in Niamey that it was incumbent on them as Libya’s neighbours to support the Presidency Council and the LPA and to encourage the HoR to endorse the new GNA cabinet when it was presented to them. Kobler said he was heartened by the coordinated frontier control and joint training exercises established by countries bordering Libya. This was vital to stem irregular migration and the flow of illegal weapons. He noted “Despite the weapons embargo there are an estimated 26 million weapons in Libya. These weapons do not fall from the sky, they come from land and by sea. I urge all member states to abide by the arms embargo and to control their borders”.